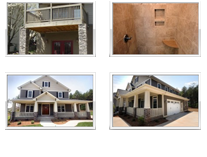 New construction minutes to downtown Greenville. North Main Building & Design is excited to announce that we will begin our next new construction project on DuPont. This home will feature 3 bedrooms & 2 bathrooms. This home combines the flavor of a vintage Southern cottage with the conveniences of today. A welcoming front porch and charming details give this home memorable curb appeal. Inside, a large great room is open to the dining room and kitchen…providing a spacious area for entertaining. The split bedroom arrangement is perfect for families. Two bedrooms at the front of the house enjoy generous closet space and a comfortable bath, while the spacious master suite at the rear of the house has a large walk-in closet and luxurious private bath. A two car garage at the back of the house provides storage for the family cars and more.